I imagine is about his most prized possession, his case of recorders, made specially for him and carefully designed to fit under plane seats. It contains instruments in all shapes and sizes and of all ages, including the tiny one on which he plays the tune that introduces his highly successful Radio 3 series, Pied Piper. He talks, in interview, as easily and fluently as he does on that programme, and last time we met the first subject was records and recorders as he has two discs of solo music soon to be issued. "One is for EMI", he told me, "and contains two staple baroque works,the Sammartini Concerto in F for descant recorder and the Telemann Suite in A minor for treble recorder, which I regret to say is still too often played by a flute. Both of these are with the Academy of St Martin's. And we've also included an interesting piece, which we recorded at the suggestion of Christopher Hogwood, and that's the Concerto for recorder and strings by Handel. Every Handel scholar will tell you that it doesn't exist. In fact, it's the familiar Concerto in B flat, known in various versions for different solo instruments and strings. "Now Christopher has discovered that there was a reference in Sir John Hawkins's History of Music to Handel having written this in the first place for recorder. As has been observed, it isn't very suitable for the organ, which usually plays it, as it goes too high and doesn't fit well under the fingers. The right-hand of the organ part absolutely fits the range of the treble recorder in F, and there are many characteristics that make it similar to Handel's other writing for the instrument: the key, B flat, and range are absolutely the same as that of the OD. I sonatas and the slow movement bears a striking resemblance to one of the movements in the G minor Sonata, so very little had to be done to turn this organ concerto into one for recorder". The other solo record is for Argo. "We set ourselves the rather difficult task of recording a programme of English music that was popular in London at the beginning of the eighteenth century, using instruments of almost exactly that time, which were by English makers with the exception of the theorbo, and trying to find out something more about the music by using these instruments. 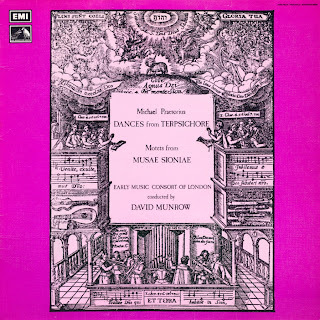 This disc includes another rarity Handel's familiar F major recorder sonata, but with original eighteenth-century ornamentation, which was taken from a barrelorgan version. It's all very elaborate, and we may well be shot down for doing it. "Of course, the pitch of these instruments is much lower. They are about three-quarters of a tone low by today's standards. It makes the treble recorder much less squeaky, if you think it's squeaky in the first place". A more immediate release is the Dufay disc, made with the Early Music Consort of London and reviewed on page 2049 of this issue. "This year is the 500th anniversary of Guillaume Dufay's death. Although the actual day does not fall until the end of November, we thought we would spend as much of the year as possible celebrating. One very good reason for doing so is that when we suggested to the director of an eminent European festival that he should mount a concert for the occasion, he said what a good idea but who was Dufay? Here is a composer with a fantastic and wideranging genius and only a tiny part of his music is known, let alone on record. People often say that the early music revival is too concerned with the lighter side of the repertory, the frivolities, so here's a chance to rectify that. In fact when we performed the Mass Se le face ay pale in the Queen Elizabeth Hall we had a different kind of audience. I think those who did come were as amazed as we were when we first looked at the Mass at how much variety there is in it, an extraordinary range of styles and the impact made by the longer movements. In the "Gloria" and the "Credo", Dufay has this marvellous technique of repeating his tenor part in ever-shortening notes while at the same time adding more ideas, so that the climaxes become quite complex?incredible to think these ideas were worked out 500 years ago. "Dufay based the Mass on one of his most popular songs, and this exists itself in four forms as a chanson, a four-part instrumental version, and in two brilliant keyboard arrangements in the Buxheim organ book. For the mass we have eight singers and six instrumentalists. It's very hard to sing, very taxing vocally. We've never had exactly this combination before, and we've worked very hard to achieve a good blend. We've used two of the larger sizes of the cornett family, an alto and tenor, to double the two top parts. These have the capability to blend best with voices. Some people use shawms and high recorders when they perform these Renaissance masses. I can't believe they were actually used, except in the earlier cases of Perotin and possibly Machaut, because the whole idea of the development of polyphonic music is the equality of the parts to achieve a real flow. Any shawm would have blown the head off any counter-tenor". Munrow is very keen on collecting records. "As with most of the members of the Consort, I await the arrival of our own records with excitement and apprehension. I usually find a sense of disappointment after listening to them a couple of times because I wish we'd done this or that a different way. But I love buying other people's. I never go abroad without coming home with twenty or thirty, not of early music but of folk music. That's one of the reasons, incidentally, why I like doing Pied Piper so much?I use my own records, often rare ones, that aren't in the BBC library. "I don't just like what's on a record but the sleeve and the label, everything. That's perhaps why I enjoy making them myself. I get involved in choosing the photos, writing the notes, and thinking of the whole concept. I try to think of a disc as an entity, and plan it carefully. Sometimes one wants to make people turn over as soon as possible, sometimes one wants a contrast between sides?as in the case of our first disc for HMV of two Renaissance dancebands (HQS1249, 10/71). On one side everything was very loud, cheery, straightforward Susato, then very complex, quiet, sophisticated Morley consort pieces on the other. For some people, making a record is going into a studio, giving your all, and then forgetting about it. For me that's only the beginning. The time I actually spend in the studio is only about a tenth of the total expended on producing it. You can do things on a record that you can't attempt at a concert. You can juxtapose things, as on the Dufay record, that I don't think would work in a hall. One has to find the best way of 'putting over' early music, and what works in one medium doesn't necessarily work in a completely different one". Although he has never thought of himself as a composer, he has become caught up in writing through his recent work in films. "First of all came half the music for Ken Russell's The Devils and then being involved in the TV series and subsequent film of Henry VIII. That, I thought, would be the end of it. Suddenly I was asked to go to Dublin to talk to John Boorman who was directing Zardoz with Sean Connery, a film that makes its impact on all sorts of levels. Boorman knew, almost obsessionally what he wanted. That was fun as we could do all kinds of new effects. Then, one night when I was in bed, a Frenchman rang up to ask if I'd do the music?immediately?for a film about the cyclist Eddy Mercx. I wasn't too keen about it. But he sent a man to sit on my doorstep till I agreed. The director had the seemingly wild idea of putting early music to this film. I saw the film on the Friday before Christmas, and I realised it might work. I was won over. I arranged the music in about a week, and in one mad day, on December 30th, we recorded 45 minutes of music in 16 tracks and then edited and mixed the film soundtrack in mono, and produced an LP in stereo. It took all day and all night, and I was shattered at the end of it. I hope it works". Munrow and his Consort are now so well established on the musical scene that it is difficult to realise how short has been its existence. How did it all start ? "At Cambridge I met Thurston Dart. In his study at Jesus, he had a crumhorn hanging on the wall. One day I asked him to lend it to me, and that awakened my interest in the field of old instruments. After coming down I did research into seventeenth-century bawdy songs at Birmingham University. Then I managed to get into the wind band at the Royal Shakespeare Theatre in Stratford, playing the bassoon and recorder while at the same time starting serious research on the techniques of Renaissance instruments. "I began to put on concerts of my own, experimenting with different combinations of people and instruments. By 1967, I had the core of the Consort. Then I heard James Bowman and thought that here was the most fabulous 'noise' I'd ever heard, so he joined us too. From coming together just for fun, the whole thing `snowballed' very quickly". His knowledge of early music has naturally grown enormously in the seven years since the group was formed, first helped by lecturing at Leicester University. "But I still believe that appreciation of it is in its infancy as nobody has yet formulated principles of aesthetic criticism on the subject. Such textbooks as exist, although informative, don't actually bring you near to the music. That means that the various groups are bound to disagree about some aspects of performance. My only dictum is that there are no golden rules, and we would be much better off if there were fewer axes being ground". He does have certain tenets. "I think that the vocal music of that time needs to be sung in a radically different way from later music. Basically, there was no vibrato. As there were two different styles for instruments playing inside and outside, there was a similar differentiation in vocal methods. But the singers who performed in church almost certainly sang quietly and expressively, and when they took their cassocks off they surely sang in the same way at court. Most important of all is expression. A Machaut song should communicate as directly, albeit in a different way, as one by Schubert". Why did he think early music had come into fashion? "Like the whole antiquarian business, it's a twentieth-century phenomenon. After two world wars, we're not very keen at looking into the future. We prefer to look back at what, superficially at any rate, look like brighter and simpler times. Of course, that's a vast illusion. We like to enjoy our early music in a world that has lavatories and central heating, don't we.Then, although I'm personally an enthusiast for a lot of modern music, composers today have, in the main, failed to satisfy the demand, the kind of thing that the concert-going, record buying, radio-listening public wants. But I sincerely hope they don't just come for new aural sensations and that in ten years' time, concerts of early music will be nearly as common as baroque concerts today". Munrow spends much of his leisure time listening to folk music and jazz. "That's somehow allied to what I'm professionally involved in.Obviously I get tired of listening to medieval and Renaissance music because I hate my own and I'm a bit critical of others and I have an enormous admiration for some jazz players. I prefer small-band jazz. Other than that, I'm almost a fanatic about Elgar. If I ever did conduct, I would love to have a go at Falstaff, his supreme achievement in construction. I love Purcell, even when he has an off-day. I love some singers.Alfred Deller and Cleo Laine for instance, and I'm constantly fascinated by the possibilities of the human voice. Opera. Yes, up to and including Mozart. Then Puccini but my one blind-spot is Wagner. He gives me physical and emotional indigestion". He works incredibly hard. "In eight years of marriage, we've had hardly any holiday. My only hobby, really, is sailing. Indeed, I enjoy anything to do with water. I enjoy the theatre, too, when I have the time. But who am I to complain. How many people have such a pleasant way of life? That is doing what one wants to do". His wife Gillian is both his super-secretary and chauffeur, typing out a programme at midnight or whatever, and driving David, a non-driver, from place to place. "We used to do lecture recitals together, but I seldom have time for those nowadays. She played percussion, medieval bells and psaltery as an accompaniment to about forty of my instruments". A final word, on critics: "Sometimes I just feel the arrows being sharpened by the specialists, so that you get to the stage that you write programme notes almost to pluck out the barbs in advance. I prefer those who come to try and enjoy the performances, rather than indulging in one-upmanship".